This essay examines the extent to which we can expect Indigenous Knowledge, understanding, and voices on climate change (‘Indigenous content’) to be captured in WGII of the IPCC Fifth Assessment Report (AR5), based on an analysis of chapter authorship. Reviewing the publishing history of 309 chapter authors (CAs) to WGII, we document 9 (2.9%) to have published on climate change and Indigenous populations and involved as authors in 6/30 chapters. Drawing upon recent scholarship highlighting how authorship affect structure and content of assessment reports, we argue that, unaddressed, this will affect the extent to which Indigenous content is examined and assessed. While it is too late to alter the structure of AR5, there are opportunities to prioritize the recruitment of contributing authors and reviewers with expertise on Indigenous issues, raise awareness among CAs on the characteristics of impacts, adaptation, and vulnerability faced by Indigenous peoples, and highlight how Indigenous perspectives can help broaden our understanding of climate change and policy interventions. The online version of this article (doi: 10.1007/s10584-011-0350-z) contains supplementary material, which is available to authorized users. A comment to this article is available at http://dx.doi.org/10.1007/s10584-012-0442-4. The review process for the Intergovernmental Panel on Climate Change (IPCC) fifth assessment report (AR5) is underway. AR5 will be the culmination of over two decades of evolution for the IPCC since the first assessment report was released in 1990. From an initial review primarily of the physical science underpinnings of climate change, assessment reports have developed into a state-of-the-art characterization of understanding on multiple aspects of climate change. Authorship has broadened to include contributions from scholars from multiple disciplines, while the addition of a summary for policy makers has increased the IPCCs relevance to policy makers and the public at large. These have been significant developments, although scholarship has highlighted how the knowledge and decision making procedures of the IPCC elevate the role of positivist science, marginalize place based-knowledge in the pursuit of global consensus, and can thus give decision makers a false sense of confidence in the nature of the problem and solutions needed (Beck 2011; Hulme 2010, 2011; Jasanoff 2010a; Radcliffe et al. 2010). IPCC Working Group II (WGII) characterizes understanding on climate change impacts, adaptation, and vulnerability, and is a central component of AR5, reflecting the growing recognition of the importance of the human dimensions of climate change. The scope of WGII has expanded from the 7 chapters in the first assessment report in 1990 to the 30 chapters planned for AR5, covering populations inhabiting vulnerable regions and vulnerable human systems alongside more theoretical examinations of adaptive management, ethics, and decision making (see supplementary data). The epistemological critiques applied more generally to the IPCC are therefore less relevant to WGII where the social sciences and humanities have had more prominent roles, place-based research profiled, and the socio-cultural dimensions of climate change examined (Bjurström and Polk 2011b; ReisInger 2011). Nevertheless, concern has been noted regarding the extent to which the research on Indigenous populations has been captured in previous assessments and might figure in AR5 (Ford 2009; Ford et al. 2010; Hulme 2011; Huntington 2011; UNU 2011). There is no Indigenous population’s chapter planned for WGII for example, and aside from the affirmation of the importance of Indigenous Knowledge at the 31st and 32nd Session of the IPCC, there is limited indication at an institutional level that this is a priority area for improvement or development. This is an important gap because Indigenous populations have been identified as a highly vulnerable subgroup, while their accumulated knowledge can help us understand how the climate is changing, characterize impacts, and provide valuable lessons for adaptation (Ford et al. 2010; Green et al. 2009; Salick and Ross 2009; Turner and Clifton 2009). Indeed, the alternative perspectives and worldview embodied in the situated knowledge of Indigenous populations make it easier to imagine and design alternative approaches to addressing climate change than those based on science alone (Hulme 2010; Pielke 2008; Sarewitz 2011; Walker et al. 2006). In this essay we examine the extent to which we can expect Indigenous Knowledge, understanding, and voices on climate change – what we term ‘Indigenous content’ – to be captured in WGII AR5, based on a review of chapter authorship. This question has particular salience, for while it is too late to alter the structure of AR5, a priori identification of potential overlooked areas can be used to inform lead authors, influence the chapter review stage, and guide the strategic recruitment of contributing authors. This is preferable to the post hoc critiques that have dominated the literature examining IPCC, particularly given the publication of AR5 at a crucial time for climate policy and role of AR5 as a key source of knowledge until 2020/21 when the sixth assessment report is scheduled to be published. We begin the paper by reviewing recent critiques of the IPCC, examining implications for Indigenous content. We then develop a methodology to appraise AR5 WGII with respect to Indigenous content and present results, finishing by arguing why we believe a lack of Indigenous expertise among authorship matters and outlining what needs to be done. The IPCC has made unique and valuable contributions to evaluating and synthesizing knowledge on climate change, providing information essential for policy response, and like others we hold the IPCC in high regard. Despite these contributions however, there has been a proliferation of scholarship critiquing the IPCC in-light of ‘Climate-gate’ and ‘Himalaya-gate,’ focusing on the procedural rules governing how the IPCC operates, how uncertainty is dealt with and communicated, how non-peer reviewed sources are integrated, and accountability mechanisms (IAC 2010; Jasanoff 2010b; Oppenheimer et al. 2007; Petticrew and McCartney 2011; Rothman et al. 2009; Solomon et al. 2008; Tol 2011; Yohe and Oppenheimer 2011). Other studies have documented geographical and disciplinary biases in IPCC assessment reports, which have been shown to be dominated by the biophysical sciences, economics, and authors from developed nations (Bjurstrom and Polk 2011a; Bjurström and Polk 2011b; Hulme and Mahony 2010; Ravindranath 2010; Vasileiadou et al. in press). This work highlights that the IPCC-process is neither as value free or comprehensive as originally claimed, but nevertheless notes the significant value of assessment reports and the need to expand the scope of content by diversifying authorship, integrating grey literature, and improving accountability. Scholarship has also examined the epistemological framing of the IPCC process, highlighting how knowledge and decision making procedures establish climate change as an environmental problem that can be best understood through objective, positivist science (Pielke 2008, 2010; Pielke and Sarewtiz 2005). Beck (2011) notes how the IPCC follows a linear model of expertise that prioritizes ‘value free’ science, encourages the separation of problem from response, and prioritizes an impacts-based approach with its focus on scenarios and climate modeling. Hulme and Jasanoff have written widely about the globalizing of knowledge embodied in the IPCC with its global focus and emphasis on consensus (Hulme 2010, 2011; Hulme and Mahony 2010; Jasanoff 2010a). They argue that this homogenisation of knowledge, detached from local values, prioritizes positivist disciplines at the expense of the interpretative, and shifts attention away from how climate change is experienced, understood, and responded to in specific places and by different cultures, creating a ‘flat’ or ‘brittle’ understanding open to critique. These arguments have particular salience when examining how Indigenous content is integrated into IPCC, with some scholars highlighting the low prominence given to Indigenous perspectives and research in previous assessment reports (Ford 2009; Ford et al. 2010; Hulme 2011; Huntington 2011; UNU 2011). This is evident in chapter content and structure of AR4, where, outside of the Polar Regions chapter, Indigenous populations are rarely profiled as an at-risk group, or considered to have ‘special rights’ in the context of a changing climate. It is evident in how research has been integrated into chapters, with information about climate-society interactions embedded in myths, stories, tradition, and observations largely absent, despite the recognition of the importance of these socio-cultural-spiritual aspects of Indigenous Knowledge for understanding climate change impacts, adaptation, and vulnerability, alongside the more fact based Traditional Ecological Knowledge (TEK) (e.g. Ford and Smit 2004; Green et al. 2010; Huntington et al. 2005; Huntington 2011; Krupnik and Jolly 2002; Laidler 2006; Orlove et al. 2010; Riedlinger and Berkes 2001). Close reading of previous WGII chapters also reveals that contributions from the peer reviewed and grey literature are not incorporated, specifically place-based analyses and studies that do not explicitly address climate change but contain invaluable insights on determinants of vulnerability and adaptation. This scholarship highlights that the challenges Indigenous populations face – climate-related or otherwise – can only be understood with reference to socio-economic-political marginalization experienced by many populations, colonial history, and land dispossession. The overlooked issue of climate change and Indigenous populations reflects, on the one hand, the epistemological framing of IPCC assessment reports noted above. This is insufficient to fully account for the neglect however, as previous WGII assessments have integrated place-based analyses, examined vulnerable sub-populations, and focused on the broader socio-economic context shaping vulnerability and adaptation. A lack of publishing on climate change and Indigenous populations, and limited number of scholars working in the area also undoubtedly plays a role. Yet this is also an insufficient explanation on its own, particularly in-light of recent literature reviews which have highlighted an emerging focus on Indigenous populations in research in some regions beginning in the 1990s (Bolton et al. 2011; Ford and Pearce 2010; Ford et al. 2011b), while attendance at the recent “Indigenous Peoples, Marginalized Populations and Climate Change” meeting held in Mexico City in July 2011, jointly sponsored by IPCC, indicates a vibrant and diverse research community (UNU 2011). Rather, these challenges are exacerbated by the limited representation of Indigenous populations or their organizations in the IPCC process, absence of authors who have worked with Indigenous peoples, and limited use of specialized academic databases and search tools in the review process. Regardless of the cause, this neglect matters because the IPCC plays a major role in informing climate policy, defining the scope of the problem (Bjurström and Polk 2011b; Hulme 2008, 2010; Hulme and Mahony 2010; Rothman et al. 2009; van der Sluijs et al. 2010). We examine the scientific expertise of chapter authors (CAs) selected for AR5 WGII as an indicator or proxy of the extent to which Indigenous content is likely to be captured, along with publically available information on the structure of WGII. CAs include what the IPCC terms Coordinating Lead Authors, Lead Authors, and Review Editors, who are nominated by member states of the United Nations (UN) and selected by the Bureau of the Working Group according to their scientific expertise, implicit to which is an individual’s scientific credentials established in-part through publishing in peer reviewed journals. While Review Editors are not actively involved in writing the text of chapters, they are included here because they “[identify] reviewers for the expert review process, ensure that all substantive expert and government review comments are afforded appropriate consideration, advise lead authors on how to handle contentious / controversial issues and ensure genuine controversies are reflected adequately in the text of the Report,” (IPCC 2008) and as such play a key role in chapter development. The selection process for CAs is purposeful with the aim of selecting author teams “[that] reflect a range of views, expertise and geographical representation,” (IPCC 2011). The composition of CAs is therefore revealing as it is indicative of the key issues perceived by the Working Group to be significant. More importantly for the work reported here, recent scholarship highlights how the expertise and disciplinary background of chapter authors has an important role in shaping the content of the chapter they’ve been designated for, determining which disciplines are emphasized, how knowledge is structured, and the extent to which topics are assessed (Beck 2011; Bjurstrom and Polk 2011a; Bjurström and Polk 2011b; Grieneisen and Zhang 2011; Hulme 2011; Sarewitz 2004). We therefore infer that an absence of CAs with expertise on Indigenous populations and climate change would likely continue the limited consideration given to Indigenous content in WGII, or at least reduce the chances that such content will be comprehensively integrated and addressed. To characterize author expertise we first developed a database of all 309 CAs listed by the IPCC for AR5 WGII (accessed on August 22nd 2011) (see supplementary data). Defining ‘expertise’ according to history of peer reviewed publishing, for each author we searched Web-of-Knowledge (WOK) and Scopus databases to document all scholarly publications in which authors had been involved (2000–2010) and which focused on Indigenous populations and climate change (see supplementary data for definitions), and were published in English, French or Spanish (Table 1). Full search terms to locate relevant publications are provided in Table 2. WOK and Scopus were selected because they are regarded as among the most powerful, current, and comprehensive search engines available for analysis of peer-reviewed literature, and are widely used in scientometric analyses (Berrang-Ford et al. 2011; Ford et al. 2011a). In addition, we used the LILACS search engine to locate relevant Spanish publications and érudit for French publications. To validate the keyword search of academic search engines, we also used Google and Google Scholar to conduct an unstructured publication search for each CA. “Indigenous” or “Aboriginal” or “Aborigine*” or “Trib*” or "Native people*" or "Native American" or "Native population*"
"Climat* change" or "Global warming" or "Climat* forcing" or "Greenhouse effect" or "Environmental change"
indígenos OR indígenas OR aborígenes OR "poblaciones nativas" OR "poblaciones indígenas" OR indigenas OR indigenos OR +"poblaciones indigenas"
indigène OR autochtone OR aborigène OR tribu OR amérindien OR "peuple natif" OR "population native"
"changement climatique" OR "réchauffement planétaire" OR "réchauffement climatique" OR "réchauffement global" OR "effet de serre" OR "changement environemental" OR "forçage climatique"
The above search returned 2,168 articles. Selected articles were then examined to identify those with an explicit focus on Indigenous peoples and climate change, as per Table 1. This was conducted based on publication title and review of abstracts, a commonly used procedure in literature reviews. Eleven articles authored by 9 CAs were retained for final analysis, with the majority of publications excluded due to not having an Indigenous peoples focus. For instance, articles focusing on indigenous and native plants or river tributaries (stemming from the trib* search term) frequently came up and were excluded. While it is CAs who are primarily responsible for chapter content and structure, external reviews are also important, with each chapter reviewed firstly by experts and then by governments and experts. External review could therefore potentially moderate the implications of an absence of CAs with expertise on Indigenous peoples and climate change. A secondary analysis was therefore performed on AR4 WGII to examine if issues pertaining to Indigenous populations were noted in reviewer comments previously, thereby providing important context to the role of external review vis-à-vis Indigenous content. All comments provided for chapters in AR4 WGII through the First and Second Order Draft (expert and government) review were located on the IPCC website and examined for content to identify if any comments provided were related to Indigenous peoples. This involved key word searching of comments using English-language search terms for Indigenous populations, listed in Table 2. Comments flagged by the search that included substantive contributions regarding Indigenous populations were recorded. Nine CAs (2.9%) for AR5 WGII have published on topics focusing on Indigenous populations and climate change, accounting for 11 articles (Tables 3 and 4). CAs are first author’s on 4 (36%) of these articles, and contributing author’s to 7 (64%). Perhaps more instructive than the overall number of CAs who have published on climate change and Indigenous populations, is the distribution of expertise by chapter. Six of the 30 WGII chapters (20%) have authors with Indigenous expertise represented: Polar Regions (2 authors), Africa, Livelihoods and Poverty (2 authors), Human Security (2 authors), Terrestrial and Inland Water Systems, and Adaptation Needs and Options (see supplementary data). The analysis indicates that there are no CAs with Indigenous expertise involved in chapters which cover regions with large Indigenous populations including Australia, Asia, Central and South America, or chapters focusing on sectors where Indigenous peoples have unique vulnerabilities and needs including Human Health, Adaptation Opportunities, and Emergency Risks and Key Vulnerabilities. Soares-Filho B, Moutinho P, Nepstad D, et al. Azevedo-Ramos C, do Amaral BD, Nepstad D, et al. Ricketts T, Soares-Filho B, da Fonseca G, Nepstad D, et al. Woo, MK; Modeste, P; Martz, L; Blondin, J; Kochtubajda, B; Tutcho, D; Gyakum, J; Takazo, A; Spence, C; Tutcho, J; Di Cenzo, P; Kenny, G; Stone, J; et al. Nyong A., Adesina F., Osman Elasha B.
Sandbrook, C., F. Nelson, W. D. Adams, and A. Agrawal. Forests, carbon, and the REDD paradox. Content analysis of comments to chapters in WGII AR4 indicates that out of 37,185 comments provided, 115 are relevant for Indigenous populations (0.3%) (see supplementary data). Ninety eight (85%) of these comments were accepted. Approximately half (n = 47) of these comments are regionally focused to developed nation chapters: 13 for Australia and New Zealand (0.62% of the total for this chapter), 20 on North America (0.98%), and 22 for Polar Regions (1.2%). All other chapters have fewer than 10 comments, including seven focusing on Latin America (0.4% of the total for this chapter), 2 on Asia (0.13%), 8 on Africa (0.55%), and 1 on small islands (0.9%). Both the Europe chapter and Coastal Systems chapter had no Indigenous content-related comments. The methodology developed here contributes to a growing scholarship examining the structure and organization of the IPCC using scientometric analysis. It is noteworthy however, that to our knowledge, no other studies have used publishing history of chapter authors to a priori identify expertise of authors and with the aim of informing the assessment process as it evolves. The use of publication metrics offers a systematic and replicable means of doing this based on standardized data readily available through web-based search engines, and is particularly relevant here given the limited means of evaluating AR5 with respect to Indigenous content (e.g. an Indigenous chapter). We acknowledge that focusing just on peer reviewed articles is a limited definition of expertise, overlooking other scientific contributions, although note that publication record plays an important role in CA screening during selection by member states and the Bureau of the Working Group. It was not a viable option within this project to locate other contributions which would be a significant undertaking for 309 authors. Publications by other authors may have been excluded by the absence of population specific search terms when searching for articles by author (e.g. population name, political boundaries) reflecting the scope of the review and challenges of using specific search terms with at least 5,000 distinct Indigenous groups worldwide. We also focus only on authors who have published explicitly on climate change and Indigenous peoples, noting some CAs have published on other issues facing Indigenous populations (e.g. deforestation, knowledge systems, biodiversity) and may therefore be familiar with the key issues faced. The analysis may therefore underestimate the presence of authors with Indigenous expertise in WGII. Nevertheless, the use of multiple search engines, key words in three languages, and validation using an unstructured author search, was designed to capture as many relevant publications as possible to characterize expertise. Moreover, we also searched all authors for generic publications on Indigenous populations (i.e. not limited to climate change), and only revealed a further 4 authors with expertise. The influence of authorship is likely to be compounded for Indigenous populations, where research is often published in specialized journals or in the grey literature, and as such is harder to access. The use of systematic review procedures and guidance on the use of specialized databases and search tools would help manage these challenges, but limited guidance on the actual mechanics of identifying and synthesizing relevant scholarship are provided by IPCC to authors (Petticrew and McCartney 2011; Tol 2011). 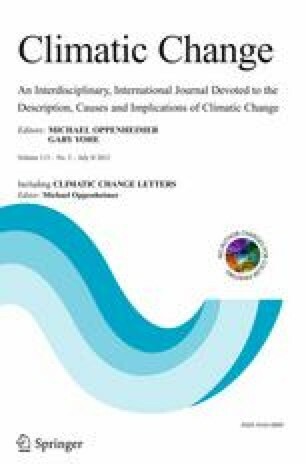 Insights on the human dimensions of climate change can be derived from regional and global studies, but generalizing is problematic for Indigenous groups for whom impacts, adaptation, and vulnerability are highly place and culture specific, and mediated by worldviews which place significant value on interpersonal and environmental relationships, stewardship, life experience and balance, spiritual considerations, family, tradition, and oral history (Beck 2011; Ford et al. 2010; Ford et al. 2006; Green et al. 2009; Turner and Clifton 2009). These unquantifiable socio-cultural dimensions integrate highly politicized issues surrounding colonial history, marginalization, land rights, and Indigeneity, and as such challenging to integrate into the IPCC with procedures that emphasize its apolitical nature (Beck 2011; van der Sluijs et al. 2010). Having experts in senior authorship roles with first-hand experience of working with (and publishing on) Indigenous populations in a climate change context is therefore important for identifying, analyzing, and synthesizing these unique dimensions of climate change, particularly with the epistemological framing of IPCC and consensus-based decision making which can exclude / inadequately represent the views of those not present (Ho-Lem et al. 2011). The structure and author composition of WGII, as it is, could limit the extent to which Indigenous content is captured and examined in AR5. Analysis of reviewer comments provided to AR4 provides little evidence that, unaddressed, a lack of Indigenous expertise among CAs will be moderated by the review process, with only 0.3% of comments pertaining to Indigenous issues. Especially for chapters focusing on regions outside of developed nations, and for chapters focusing on specific sectors or topics, comments with regards Indigenous populations are largely absent; it noteworthy that these chapters in AR5 also have limited Indigenous expertise among CAs. The potential implications of this are not trivial as AR5 will be published at a crucial time, with promised investments in adaptation support through the UNFCCC expected to be widely debated. IPCC assessments represent ‘certified’ scientific and policy-orientated knowledge (van der Sluijs et al. 2010), and will frame (inter)national climate policy herein (Leemans 2008; Rothman et al. 2009; van der Sluijs et al. 2010; Watson 2002). WGII chapters identify vulnerable regions and populations in need of support, human and biophysical drivers of vulnerability today and in the future, and adaptation opportunities and constraints, and have a large influence on UNFCCC negotiations and planning (Leemans 2008; Ravindranath 2010). If Indigenous issues were to have a low prominence in AR5 this would therefore be expected to have policy implications, with few other international assessments examining the state of current knowledge on Indigenous peoples and climate change. If the lack of Indigenous expertise in WGII matters – as we argue – what can be done about it at this stage of the AR5 process? While it is not possible to change the composition of CAs at this stage, there are opportunities for feedback on Indigenous content to be prioritized. IPCC procedures provide for the solicitation of expert reviews and the recruitment of contributing authors. Researchers with Indigenous expertise and representatives of Indigenous organizations need to be prioritized within these activities to ensure relevant Indigenous content is integrated and examined, specifically for key chapters where issues related to Indigenous peoples are prominent. Our analysis of AR4 comments indicates that this will not necessarily occur automatically. Activities designed to raise awareness among CAs of Indigenous issues are also needed. The “Indigenous Peoples, Marginalized Populations and Climate Change” meeting held in Mexico City in July 2011, was important herein, and indicative of further action needed (UNU 2011). These strategies are important for elevating Indigenous issues in AR5 but are unlikely to fully redress the absence of expertise among CAs. For instance, while contributing authors and external reviewers play a key role in chapter development, the limited institutional and scholarly recognition for such roles limits the extent of their contributions (Tol 2011; Yohe and Oppenheimer 2011). The Mexico City workshop in July 2011 will raise the profile of Indigenous issues, but the meeting was probably too late to have real influence, particularly with regards chapter content and scope. A key area for improvement and development for the sixth assessment report would be a strategic focus on Indigenous issues as reflected in senior-level authorship and a specific Indigenous chapter. But there is need for earlier action, with potential for an IPCC Special Report (SR) to focus on Indigenous populations. A SR would confer the credibility, rigor, and profile of an assessment report, and provide timely reporting and vital information to the scientific and policy communities (Hulme 2009; Watson 2002). Integrating Indigenous Knowledge and the myths, stories, culture, and history embedded within would be central to such a report, helping not only enhance our understanding of impacts, adaptation, and vulnerability, but also broaden perspectives on the framing of climate change. Whether the governments who make-up the IPCC would consider having a separate Indigenous chapter, or commission a special report, is debatable (and political) but there is now a rich and expanding body of scholarship on this topic from which to draw, and a large number of Indigenous organizations and groups engaged in climate change debates. More broadly, enhanced coverage of Indigenous content within WGII is important because the IPCC matters, and undeniably influences future research and policy programs at multiple levels. The possibility for an Indigenous-specific assessment(s) to take place outside the IPCC however, should also be explored. Rothman et al. (2009) and Leemans (2008) examine a number of assessment models herein, some of which, including the Millennium Ecosystem Assessment, explicitly integrate Indigenous Knowledge. The Polar Regions – as a hotspot for climate change and with a large Indigenous population – also offer a number of literature review models. The Arctic Climate Impact Assessment (ACIA 2005) for instance, reviewed the current state of knowledge on multiple dimensions of Arctic climate change, integrating both scientific and Indigenous perspectives, and was organized through the Arctic Council. Assessments led by small teams of researchers and Indigenous organizations could also be mobilized to examine specific topics of interest to Indigenous populations. Our own work developing systematic literature review approaches to characterize current understanding on the human dimensions of climate change for Canadian Inuit offers one model, involving collaboration between university and northern-based scientists, national and regional governments, and the national Inuit organization, in identifying, selecting, and reviewing the peer reviewed and grey literature (Bolton et al. 2011; Ford and Pearce 2010; Pearce et al. 2010). If assessments of this nature were to take place at a global level or with developing nations / regions, support from international organizations would be needed, either from subsidiary organizations within the UN or outside of the UN system (e.g. World Bank). Equally, they could be financed through the IPCC as part of a competitive bidding process proposed by Tol (2011). This essay highlights that only a limited number of chapter authors for AR5 WGII have expertise publishing on Indigenous peoples and climate change. Based on previous scholarship on authorship and content in the IPCC, we infer that, unaddressed, this will likely have implications for how Indigenous content is captured. While external reviewers can mediate the influence of authorship, only a small fraction of comments provided for AR4 addressed Indigenous issues. The absence of CA expertise on Indigenous populations and climate change and associated implications for content, belies the significant and unique vulnerabilities faced by many Indigenous groups, their insights on and alternative conceptions of impacts and adaptation, their potential to be affected by climate policy, proactive lobbying by Indigenous peoples and their organizations at an international level, and focus within IPCC on comparably vulnerable populations. As AR5 chapters enter the review stage it is essential that contributing authors and reviewers with Indigenous expertise are recruited, along with representatives of Indigenous organizations, and CAs made aware of relevant scholarship. Beyond AR5, the human dimensions of climate change for Indigenous populations need a more prominent spot in the IPCC process – and human dimensions scholarship mote broadly – that is commensurate with their stake in the climate change issue. This research was funded by the Social Sciences and Humanities Research Council (SSHRC), and benefited from support from the International Development Research Centre (IDRC), the Canadian Institutes of Health Research (CIHR), and the Natural Sciences and Engineering Research Council of Canada (NSEC).Thanks to Michelle Maillet for French translation, Consuelo Erasuriz for Spanish translation, and Jim Henderson who assisted with the literature search. Prof. Michael Oppenheimer and three reviewers provided detailed and constructive comments.